To understand acne, you need to know how your skin works. The pores in your skin contain oil glands. When there’s too much sebum, the pores or hair follicles become blocked with skin cells. In serious cases, when left untreated will leave you with permanent scaring. 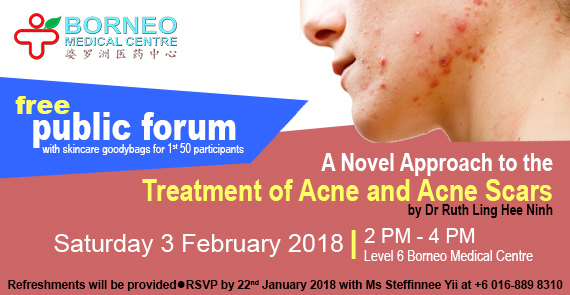 Come join us to learn more on how to manage acne and how to avoid or lessen scaring. To RSVP, please contact Ms Steffinnee Yii at +6016-8898310.